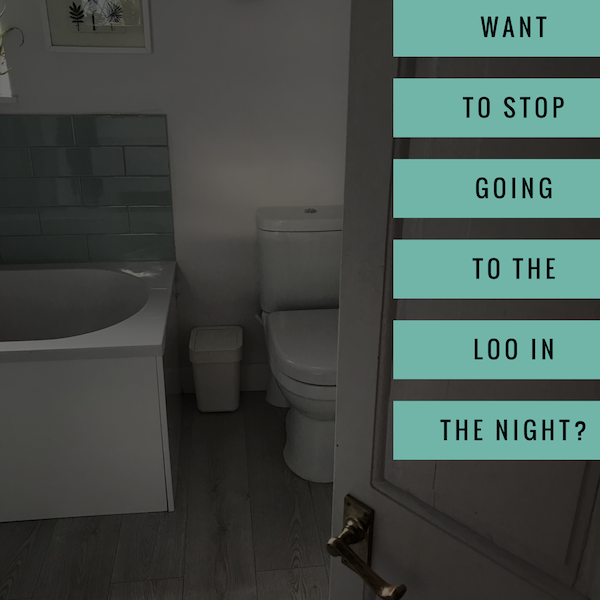 Do You Want to Stop Going to The Loo in the Night? Want to stop Waking in the night to do a Wee? When your baby finally sleeps through the night it is one of the most awesome moments of becoming a parent! It’s up there with finding out you are pregnant, having your first scan and the first time they smile! It’s life changing!! Whether you’re one of the lucky ones who reaches that fabled moment at 6 weeks or one of the slightly more frazzled parents who doesn’t get to experience it until closer to 2 years, it WILL happen at some stage! And when it does, you will sleep and it will be amazing! Right? Or perhaps not, if you are you still waking in the night to do a pee! Do you wake up and feel the urge to go to the loo? Do you lie there for a while wondering if you really DO need a wee or not? Do you lie there contemplating how cold it might be outside the covers? Do you lie there thinking about the floorboard that will creak as you creep across the landing? Do you wonder if anyone replaced the loo roll last night or if you will have to turn the light on and ferret around for a new one? By this stage you’re probably now wide awake and so you might as well get up and pee. It’s usually cold and the floor board usually creaks. You scurry back to bed and then lie awake worrying about things like paying bills, palm oil and plastic and your career or lack of it. Your partner’s breathing/snoring/whistling nose starts to really annoy you and then you remember you don’t have any milk for the morning- AND JUST LIKE THAT YOUR NIGHT’S SLEEP IS RUINED! Well, we can help!! With this little trick your nocturnal loo trips may be a thing of the past!! Do you know how to do pelvic floor exercises? If the answer is “no” then have a quick read here. If the answer is yes, then you’re in for a treat as it is so so easy. Next time you wake up and feel like you might need a wee, but you’re not desperate, and you’re not quite sure if you really need to go or not…Well just do 5 pelvic floor squeezes and this will send a magical message to your brain which basically says “I don’t need a wee, now go back to sleep”. It is literally that easy! This action is helping to retrain your bladder and your brain to dismiss those early symptoms that your bladder might need emptying. In turn this will teach your bladder to hold more urine for longer periods of time. If your bladder is really full it will not work – if you feel like you are busting for a wee then you probably really are busting and you should go. It’s so simple and it works so well! Try it tonight and let us know how you get on! By the way, we can’t take all the credit – I was moaning to the wonderful Jane Wake (our amazing pelvic floor expert) about always waking in the night for a wee and she suggested this, and BOOM it worked, and I have been sleeping like a log ever since! We are on a mission to tell every man and woman about this little sleep-saving tip! It really can be life changing if you feel like you could do with a lot more zzzzzzz! We all know someone who could do with a bit more sleep – so do a friend a favour and pass this on! And for more awesome tips for pregnancy, birth and beyond, head over to our Online Antenatal Classes. For more posts like this, check out our blog.